Mobile Shelving creates space in a confined working environment. 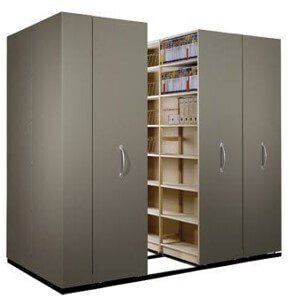 The lockable unit allows for the safe keeping of confidential information. Available in a manual, mechanical or electrical base. The mobile shelving system also offers side to side and back to back modules. The shelving is available in multiple configurations designed to your specific requirements. Easy to extend for future growth and relocate if required. The system compromises mobile bases with fanged steel wheels which locate onto steel tracks, with shelving on top of the mobile bases.